We’d love your help. Let us know what’s wrong with this preview of Isaiah 1-39 by Christopher R. Seitz. This unique commentary allows the interpretation of Isaiah 1-39 to be guided by the final form of the book. It focuses on the theological aspect of the book of Isaiah, giving special attention to the role of literary context. 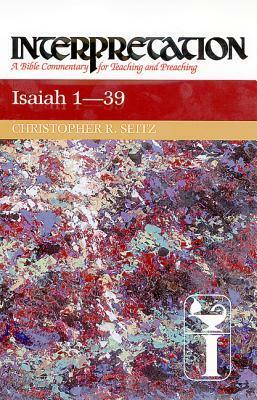 Christopher Seitz explores structural and organizational concerns as clues to the editorial intention of the final form of the material, which he arg This unique commentary allows the interpretation of Isaiah 1-39 to be guided by the final form of the book. It focuses on the theological aspect of the book of Isaiah, giving special attention to the role of literary context. Christopher Seitz explores structural and organizational concerns as clues to the editorial intention of the final form of the material, which he argues is both intelligible and an intended result of the efforts of those who gave shape to the present form of the book. To ask other readers questions about Isaiah 1-39, please sign up. Christopher Seitz has provided this commentary on Isaiah 1-39 in the Interpretation Bible Commentary (IBC) series. This is one of the few books of the Bible to get two volumes in this series. Isaiah 40-66 has been done by Paul Hanson. Reviews I have seen labeled this work a “conservatively critical commentary”, which seems fair to me. In the forward to the book, he states that he finds treating the final form of the book of Isaiah as an intelligent approach. That’s not to say, that he doesn’t tak Christopher Seitz has provided this commentary on Isaiah 1-39 in the Interpretation Bible Commentary (IBC) series. This is one of the few books of the Bible to get two volumes in this series. Isaiah 40-66 has been done by Paul Hanson. Reviews I have seen labeled this work a “conservatively critical commentary”, which seems fair to me. In the forward to the book, he states that he finds treating the final form of the book of Isaiah as an intelligent approach. That’s not to say, that he doesn’t take critical detours to imagine historical reconstructions and sources. Each time he does that, it seems to me to be the least valuable portions of the book. I find little guidance in such guesses. In the Introduction, he begins explaining the character and position of the book of Isaiah. He states that he can see why Isaiah has a place of prominence among the prophets. He admits, as well, that “Isaiah’s salvific character” plays a role. In the next section, he tries to explain why it’s a good idea to have a commentary on what he calls “First Isaiah”. As you probably know, critical scholars imagine either two or three Isaiah’s depending on the critic. Next, Mr. Seitz describes the literary structure of Isaiah 1-39. There were some interesting observations in that section. From there, he tackles the historical structure. He breaks down things like the superscription and call of Isaiah, the Syro-Ephraimite coalition, and King Hezekiah and the 701 BC debacle. In part one, he gives an overview of Isaiah 1-12 in 10 detailed pages. From there he dives into the commentary itself, which includes more interesting tidbits for the reader, though mostly all from a critical viewpoint. In part two, we have an overview of Isaiah 13 – 27 in the same style and again followed by commentary. Part three concludes with an overview of Isaiah 28 – 39 with the corresponding commentary. If you know what to expect in an IBC volume, you will find this a great one in that style. Most I’ve seen rank it above the other mid-length critical commentaries, and I’m inclined to agree with that as well. This is a respected book in the IBC series.